Let me tell you about a spellbinding card game! 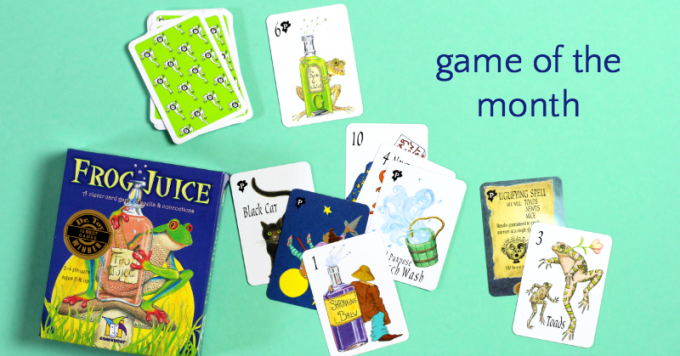 In the instruction booklet to their game, Gamewright confesses that Frog Juice is their favorite game, “It’s the perfect mix between a fairy tale and a strategy game!” And our family agrees, which is why this card game is our game of the month! We love playing Frog Juice and I can’t believe it took us so long to discover this magical game. Frog Juice is a strategy card game. The object is to earn points by capturing cards, mixing spells and using power cards. Cards feature spell ingredients like toadstools and eye of newt. Witch wash cards and black cat cards allow you thwart your opponent’s game strategy. Play starts out with four cards in the center and four cards in each hand. Players capture cards by matching cards in their hands to the cards in the center, by using cards in spells or by using the witch cards to “sweep” up cards. A few cards have special powers that keep things interesting. Playing the game requires strategy but also luck so game play is delightfully unpredictable. Because of the whimsical nature of Frog Juice it is is easy to dispense with keeping score if you have a child who has trouble with competitive games. Our family may also have been a bit dramatic when “mixing” spells. Players capturing cards from the center piles using math skills, either matching numbers or basic addition. The rules, while not difficult, are a bit more involved than, say, checkers, so I recommend reading the entire instructions out loud before beginning game play. 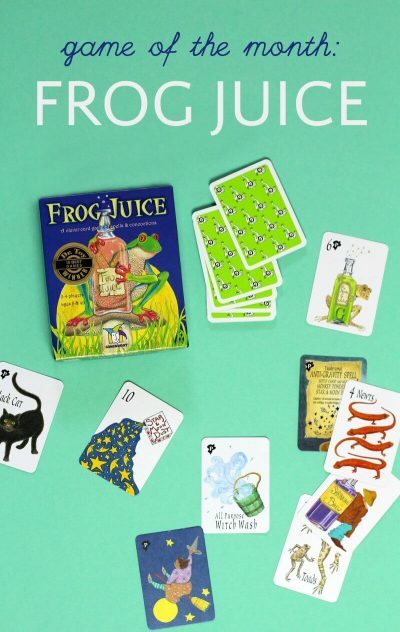 Frog Juice is a great family game, It is recommended for ages 8 and up by the manufacturer, but I believe kids as young as 5 will be able to understand the rules and enjoy playing with siblings and parents. Coincidentally, The other day our family decided to dig out frog juice from our box of games that we’ve had for a while. Maybe the instructions in our set are faulty, but my husband and I each tried to play it with our son. We both finally gave up. Not only was it complicated and confusing, but it didn’t seem like it was much fun. Once the first four cards in the middle are taken up, are they supposed to be replaced? When the cards in the middle are taken up, apparently they are just put into piles. In other words, you can’t use them. Except for points.It seemed like we just had to keep drawing cards until we got the ones we needed for our spells. Like I said, maybe the instructions were faulty, but we really had no fun playing with this one at all. On the other hand, I love your website, and often referred to it. I hope you have a wonderful day! Thank you so much for your fast reply! We are going to try It again right now!! That Worked much better!! thank you for sending that to us!